Today in Australia was the race that stops a nation doing any work during the afternoon. I'm talking about the Melbourne Cup horse race, in which we Aussies this year were anticipated to spend $140 million in bets. And 20 of those dollars were mine! 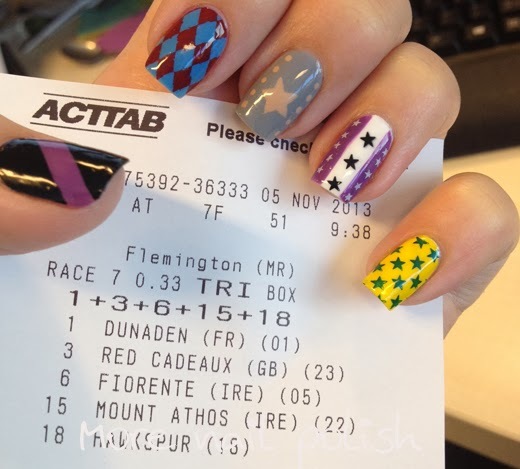 Last night I sat down with my ipad and a google search of "Melbourne Cup Jockey Silks" and I chose my four favourite designs and colours to turn into some nail art. Middle- Mount Athos - Grey with a large beige star and smaller stars on the sleeves. 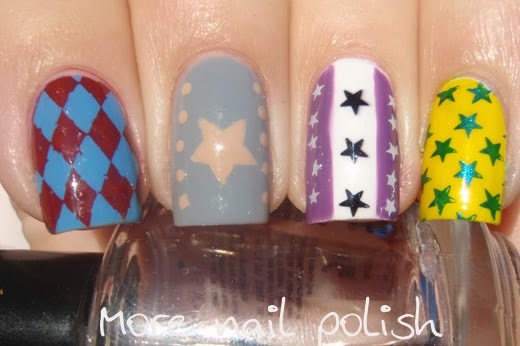 The designs were a combo of stamping, free hand and tape. The index finger with the red and blue is a little messy on the edges as I didn't have a plain diamond check stamping plate and had to use an argyle style stamp - and then carefully remove the fine lines between each diamond. 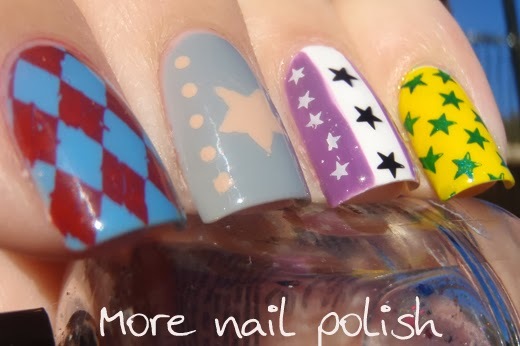 The rest of the designs were mostly stars that I stamped on. And now the unbelieveable part of the story. I won! My $20 bet only got me a 33% share of the Trifecta prize, but I still walked away with more than $1100. Here is my handful of pineapples. Whoo hoo. Did any other Aussie pick a winner today? Congrats!!!!! That's an amazing win! and I love the skittles! 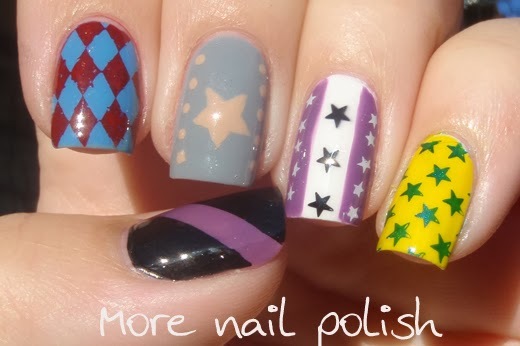 Nail art + ultimate result = awesome. That's fantastic. 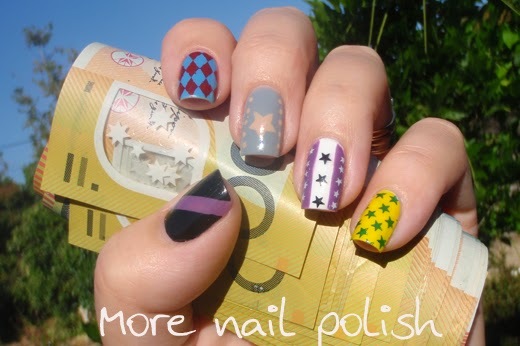 That's awesome, both the nails and the winnings based on nail art!! What a great story, now you can buy .... more polish!!!! 1,100 makes a lot of polish!! :D Congratulations!! Woohoo! Congratulations Cathy! 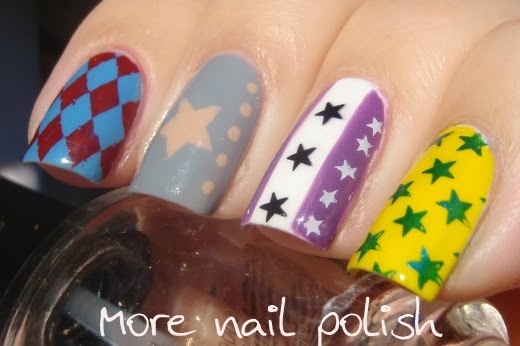 a perfect result for perfect nails! No no buy November for you!